I recently moved into a new place 2 weeks ago with a decent sized backyard. I brought my 10 other potted tomato/pepper plants, but I have 4 indeterminate plants that I need to plant. Tried digging into the soil yesterday and it's horrible soil and I can barely get 5 inches deep (I'm 28 and am very capable of digging a hole). Granted that I'm renting this house I can't put a raised bed down. Does anyone have a potential solution to my problem? Appreciate any insight. Whenever I have difficult soil to dig, I get it started as best I can, then fill the resulting crater with water. After the soil is softened continue digging. So, I guess you could then add whatever amenities you need to the hole and mix with soil, then plant. There have been times though, when I have tried digging into extremely heavy, gummy clay where no matter how wet it is, it's still almost impossible to dig. Plant them in large pots. 20 inch pots or 18 gallon containers. You will need a cage or trellis to support the vines. One tomato per pot. Pots are a good solution if you are renting. Why's the soil difficult to dig in? Is it clay, or because of roots/rocks or something else? Thanks for the responses! Honestly I have no idea why the soil is so difficult to dig in. I tried to go a bit further and started to hit old bricks and shingles and decided it was a total waste of time. It's the hardest packed red soil I have ever seen (maybe it's 100% clay mixed with some old foundation?). Either way I decided to go grab some 18 gallon 'tote' containers and now I may have a new problem on my hands (haha, oh well!) which I just posted a new topic on. Appreciate all the feedback and maybe you can lend your green thumb assistance to my new problem! Renting and can't do raised beds..... SIPs and mel's mix. 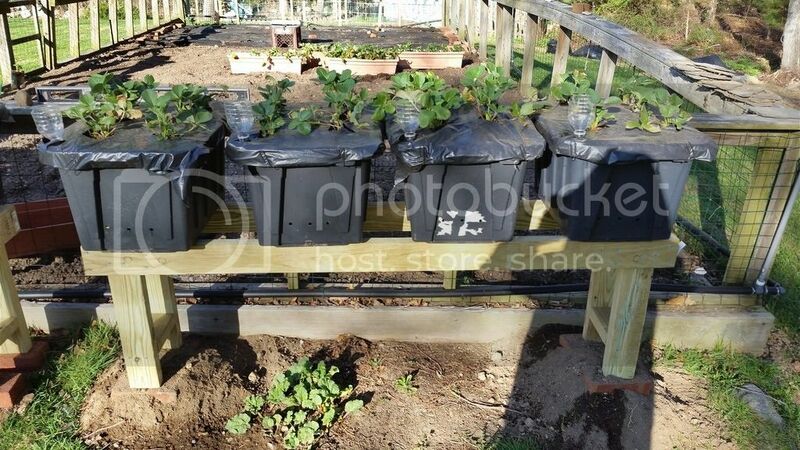 SIP = sub irrigated planter = self watering planter = self watering container (also called 'earth box' and a few other names. Plants I have in SIPS are far outpacing the ones in other containers and in the ground. Old bricks and shingles...doesn't sound too good. Probably stuff with lead based paint in there too and who knows what else. Maybe best to stay out of the ground in this case. Some people do plant tomatoes in 5 gallon SIPS but I like more soil volume for indeterminate tomatoes so the 18 gallon SIP works bette since tomatoes have a very large root system. The five gallon buckets would be fine for the peppers. 2 hole cement blocks stacked. I do have a raised bed that is made with hollow tile, it works well and does not require a lot of skill and all you need is a string line, some rebar, and a level. The original poster said he could not put down a raised bed. For anyone else with less than ideal soil, raised beds are a good solution. If you are pushed for space, I grow tomatoes very successfully in 5-8 gallon pots. Mine grew to about 8 feet tall last year. You just have to get the feeding and watering right and they are perfectly happy. Make sure you have good drainage and I gave mine fish emulsion weekly. Er..... how do you know if its determinate or indeterminate?